The Lama Temple (雍和宫 Yōng hé gōng in Mandarin Chinese) is the biggest temple of Tibetan Buddhism in Beijing. Its name means The Temple of Harmony. 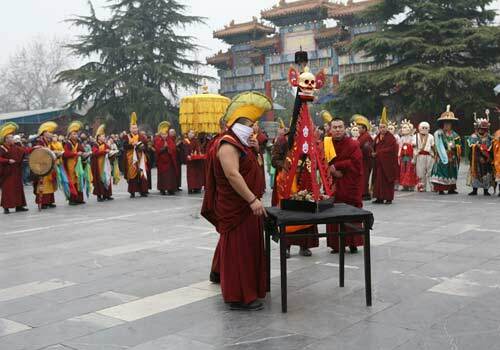 The Lama Temple is located in the northeast of Beijing at 12 Yonghegong dajie (No. 12 avenue Temple of Harmony), north-south street. It is served by bus lines 13, 116, 62 and 406. The subway also serves the temple to the Yonghegong station. 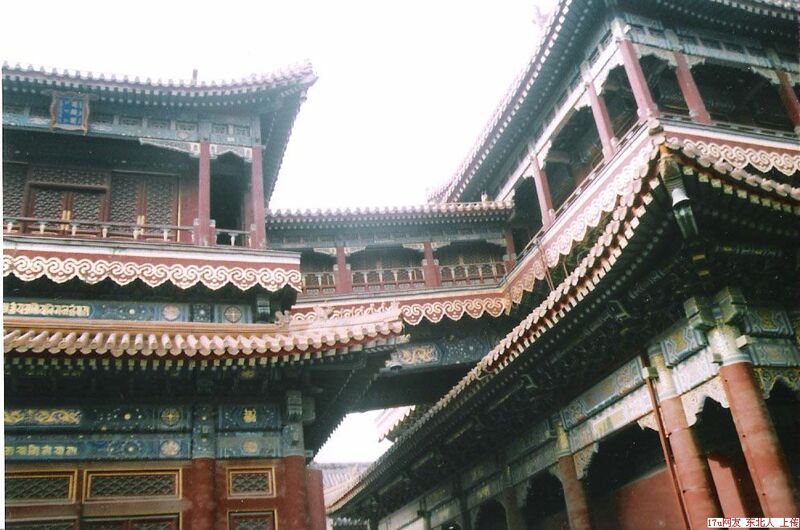 The palace was built in 1694 by Emperor Kangxi of the Qing as a residence for his son Prince Yin Zhen. When this one succeeded to the throne in 1723 the new emperor moved to the Forbidden City, took the name of Yong Zheng and renamed his old residence the Palace of Harmony. He also replaced the green ceramic tiles with yellow, the imperial color. 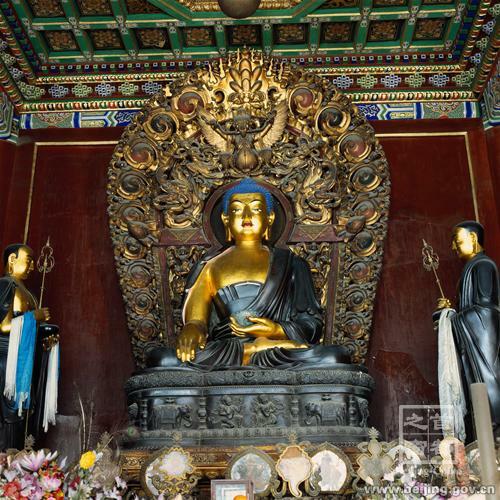 In 1744, his successor, Emperor Qianlong converted the palace into the lamasery and offered it to the Tibetan monks. 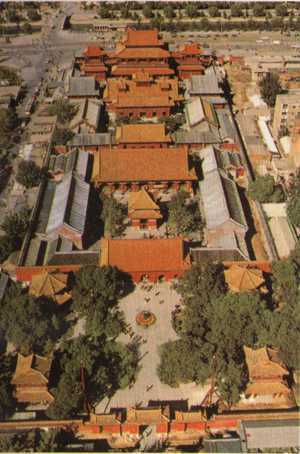 In 1949 the Lama Temple was declared a national monument because of its historical significance. The temple survived the Cultural Revolution. In 1979, major restoration work was undertaken and monks from Inner Mongolia were invited to reside there. Monks examines the Tibetan and secret liturgies of the Gelukpa order. The literal translation of Gelupkpa is paragon of virtue, name of the reformed order of the largest Lamaist school in Tibet and Mongolia. It was founded in the fourteenth century by Tsongkhapa, a monk who intended to restore the ascetic ethics advocated by the historical Buddha. The ceremony cap of Gelukpa dignitaries earned the nickname Yellow Hat in the West. It was at this school belong the great Rinpoche like the Dalai Lama. 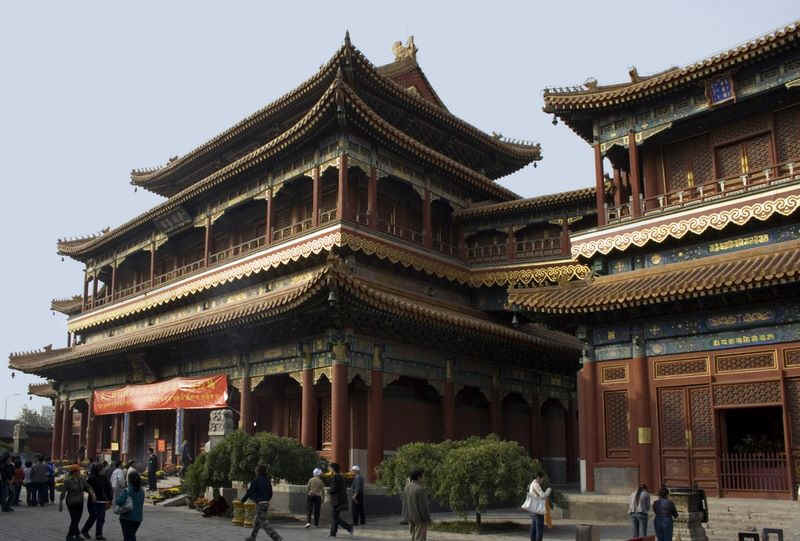 The Lama Temple is composed of a crescendo of buildings that are accessed by a series of porticos. The first door is the Gate of Harmony (Yonghemen) Ming style with beautiful yellow and green glazed tiles. The path then leads to two pavilions longevity encrusted with Buddhist symbol of long life : at the left Pavilion Drum and at the right the Bell Pavilion. 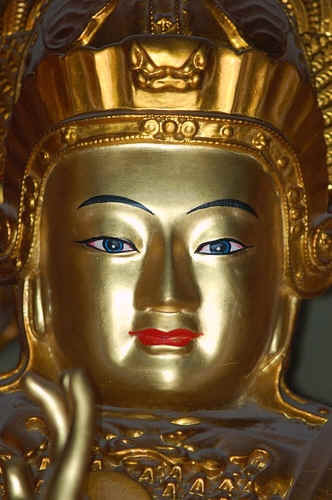 It then comes to a room that is dedicated to Maitreya, the Buddha of the future gilded wood, which welcomes worshipers to the temple entrance. According to Buddhism, the world is divided into four worlds protected by four guards. Here, four guards in polychrome terracotta crush the devils under their feet and protects Maitreya. Behind it is a statue in sandalwood Weituo, one of the guardians of Buddhism. We leave behind Weituo and find ourselves in a courtyard in the center with a pavilion erected by Qianlong in 1792 and telling in Chinese, Manchu, Mongolian and Tibetan the history of the lamasery. The incense burner in front of the stele dated 1748. On each side of the court we find rooms devoted to the study of Buddhist philosophy, medicine, esotericism and mathematics. Next we come then to the Hall of Harmony (Yonghedian). It houses three bronze Buddha which are the past, present and future's Buddha. The bases are shaped like lotus symbol of purity, the lotus petals are covered with tiny beads of wax which prevents mud from sticking to, so even if the lotus grows in a very dirty water, the flower remains clean . The Buddha in the middle is surrounded by two disciples. In front is settled before a incense burner, candelabra, vases of flowers and cloisonné enamel. On each side, nine arhats (= one who has attained the highest degree of wisdom) symbolize the Buddha and provide military protection. This room also contains drums, prayer wheels and beautiful tanka (stereotypical representation of Buddha). Then we go out and we enter a courtyard with a four-faced Buddha gilt bronze from Thailand. We then enter the Hall of Eternal Blessing which was once the bedroom of the Prince Yong Zhen. This room now houses three Buddhas of Longevity in the center, Medicine to the left and Lion's Roar (to scare the evil spirits) to the right. There are also two female Buddhas. The left is made of 6,000 pieces of silk sewn together. We cross again a yard and we get to the Hall of the Wheel of the Law (Falun Dian). This is the most spectacular of the monastery hall. It was built in 1694 and dedicated to Tsongkhapa (1357-1419), the founder of the Reformed doctrine of the Yellow Hat (Gelukpa). This is where religious services held daily. In the center of the room stands a huge statue of Tsongkhapa. The statue was cast in 1924. On the side walls of the temple, many scenes from his life are represented. In front of the statue are arranged the seats of monks. Behind the wall, 500 arhats represent the disciples who have put in writing the sutras uttered by Shakyamuni. We cross the last yard the Lama Temple and we arrive at the pavilion of the Ten Thousand Joys (Wanfu ge) built in 1750. This room is also called the Tower of the Great Buddha. 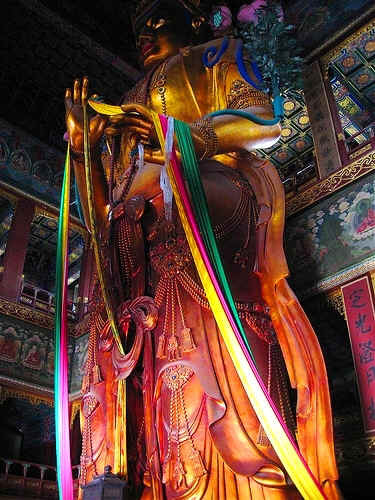 It has a huge statue of Maitreya, 26 m high. It is carved from a single block of white sandalwood! It is a gift of the seventh Dalai Lama to the Emperor Qiaonlong.